Click Holiday Schedule to find out the garbage collection changes during holidays. On the days before and after holidays, crews often double up their collection routes and start their shifts earlier than normal. If your trash collection schedule is affected by the holidays, it is recommended that trash containers are placed in their designated collection point the previous night. Visit Recycling for more information about the voluntary, curbside recycling program and the Freedom Waste drop-point for recyclables. The Compost Facility at 1560 North 8th Street is open Monday through Saturday year round (except for holidays), 7 a.m.-3 p.m. The facility accepts bagged leaves, loose leaves, grass clippings, brush, and tree limbs. There are occasions when the facility is closed for grinding of brush and tree limbs. Call 270-444-8511 for additional information. Compost is available for purchase. A two-yard bucket load is $20. The City of Paducah provides yard waste collection to residents as a part of their monthly service charge for solid waste collection. To request a collection of yard waste or brush, call the Engineering-Public Works Department at 270-444-8511. As a reminder, if you have a couple of bags of yard waste or a few twigs and limbs, it is acceptable to place those items in your garbage rollout for collection. Small amounts of yard debris can be placed in garbage rollouts. To make the collection of brush as efficient as possible and to prevent the blocking of storm drainage systems, please place brush and yard debris near the edge of the road and not in the alleys. Please make every effort to avoid placing the larger piles of debris under utility lines or near objects such as parked cars or fire hydrants. If you live on a street with curbs and gutter, place the brush and yard waste on the back side of the curb off of the sidewalk. If you live on a street without curbs and gutters, place the brush and yard waste where it can be reached but not in the drainage ditch. Brush should be no longer than 48 inches in length with trunks no larger than 19 inches in diameter. Leaves and grass clippings should be bagged, not to exceed 50 pounds per bag. All yard waste shall be placed adjacent to the street (not in the alleys). Large tree limbs, stumps, and trunks are special collections, and there could be a minimal charge. EPW encourages Paducah residents to take brush and yard waste to the Compost Facility located at 1560 North 8th Street at no charge. The Facility is open Monday through Saturday from 7 a.m. until 3 p.m. If you have a question, contact EPW at 270-444-8511. The charge for Residential Solid Waste Collection is $16.50 per month for one rollout. It is included on your monthly water bill. This charge includes yard waste collection and the weekly collection of your garbage container. The Solid Waste Division is operated as a business enterprise. The cost of the garbage collection service is paid for by the Solid Waste Collection Fees collected from residents and businesses. City Solid Waste crews work from 7 a.m. until 3:30 p.m. for residential and commercial rollout container collection. The crews who collect solid waste from commercial dumpsters work 4 a.m. to 12:30 p.m. hours since many businesses prefer solid waste collection to occur early in the day. Since crews start their collection routes early in the morning, citizens are recommended to place trash containers at their designated collection point the prior evening. Residential refuse collection is done Tuesday through Friday with Monday set aside for the collection of recyclables. There is no residential garbage collection on Sunday. 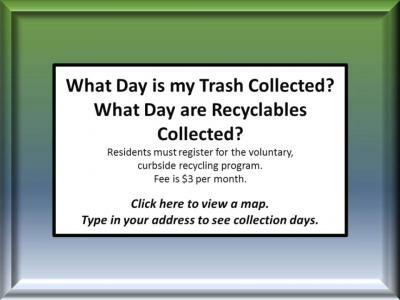 To find out what day you are scheduled for pick-up, call Engineering-Public Works at 270-444-8511 or view the Interactive Map that allows residents to type in their address to find out their solid waste collection day. We can also determine if you will need a roll-out container or if one already exists on the property. All waste must be contained in the City of Paducah issued container. If you need more than one rollout container, an additional fee will be charged. Only City of Paducah issued containers will be serviced. All City issued containers shall remain the property of the City of Paducah. If a dwelling is vacated, the outgoing resident should notify the City of Paducah Engineering-Public Works Department at (270) 444-8511 making the City aware of the vacancy. The container must not be painted, abused, mutilated, altered or modified in any manner. If the container is lost or damaged beyond repair by the resident, the resident may be held responsible for the replacement cost of the container. Report lost or stolen containers immediately to the Engineering-Public Works Department at (270) 444-8511 so that it may be replaced. To clean, use water and household detergent. It is the responsibility of the customer to keep the container clean. The City issued containers are to be placed for service pickup no later than 7 a.m. on the designated collection day. If the City issued containers ARE NOT placed before 7 a.m. our drivers will assume that no service is needed for this location. The City issued container should be removed from the City’s public right-of-way on the same day of service. The container should be placed within two feet of the roadside edge with the handles placed facing away from the street/alley. This required placement will provide better service to our customers and allow longer life for the container. The Side-Arm truck cannot service containers IF stationary objects are within four feet of the container. Examples of stationary objects include but are not limited to cars, mailboxes, utility poles, trees, shrubs, fences, etc. OBSTRUCTED CONTAINERS WILL NOT be serviced as our drivers have been instructed NOT to service containers that are obstructed to prevent damage to private and/or personal property. OVERFILLED CONTAINERS: Containers may be filled with the lid partially open. Excessive overfilling of the container MAY cause interruption of service. Containers that are properly filled prevent spillage of garbage on our streets during the collection process. Properly filled containers provide quality services to our customers and allow us to be good custodial stewards to our community and environment. UNACCEPTABLE CONTAINER CONTENTS: Containers having hazardous wastes and materials including but not limited to paint, gasoline, solvents, oil, batteries, tires, bricks, blocks, building or construction material, etc. or any other items not normally found in household garbage SHALL cause interruption to service. ANY ITEM OUTSIDE CONTAINER: Excess solid waste placed outside containers will NOT be collected on the day of service UNLESS the customer has arranged for a special pickup which MAY require an additional fee. VIOLATIONS: If you are denied service due to a violation of one or more of the above rules, once the problem has been corrected, “Call Back” service may be provided before the next scheduled service date for an additional fee. The City of Paducah has a program to assist people needing help with the trash rollout container. Click Service Assistance Refuse Collection Request for a letter and the application form. To qualify for the program applicants must be permanently or temporarily physically disabled to the extent that they cannot transport their trash to the curb for collection. A statement from a licensed physician is necessary. Also, the applicant must signify that there is no one residing in the residence over the age of twelve (12) years who is able to transport the trash container from the residence to the designated collection place. If you have trash or no longer needed items such as furniture that won’t fit in your city-issued rollout, then you may have a pay pile. To schedule this service, call 270-444-8511. The Solid Waste Division will collect and dispose of the items; however, there is a minimum fee of $25 which is added to your water bill. The fee depends upon the size of the pile and how much of the knuckleboom truck it fills. Pay piles are collected on Thursdays and Fridays using a knuckleboom truck. Place the pay pile items adjacent to the street (not in the alleys). Contact the Engineering-Public Works Department at 270-444-8511 to inform the staff that you have a pay pile. An Engineering-Public Works Supervisor reviews the pay pile and assigns a fee to it. The Supervisor calls the person listed on the water bill to explain the fee. Note: Since the fee is added to the water bill, the person named on the water bill must the one who contacts the Engineering-Public Works Department. Commercial collection is provided by the City of Paducah at various charges depending on the size of dumpster needed and the frequency of pick-ups. These prices can be obtained through the Engineering-Public Works Department. Regulations for the dumpster pad also can be obtained from the Engineering-Public Works Department which can be reached at 270-444-8511. If your rollout container was missed, please call our office as soon as possible. If possible, it will be picked up that day or the following. A tradition for many families is to conduct a thorough cleaning around the home in late winter or early spring. After gathering piles of trash and items needing proper disposal, set aside some time April 13 to take those items to the Paducah-McCracken County Spring Clean Up Day. Spring Clean Up Day is an opportunity to dispose of various types of solid and household hazardous waste. The free service, rain or shine, will be Saturday, April 13, 7 a.m. until 2 p.m. at the Republic Services transfer station, 829 Burnett Street. All Paducah and McCracken County residents must bring proper identification (such as a driver’s license) to verify residency. Accepted items include household trash, white goods (tagged Freon-free), tires (no heavy equipment, solid, rubber track, or foam-filled tires), household hazardous waste (labelled and in original container), ammunition, expired or no longer needed prescription medications, batteries, and e-scrap. New this year is the opportunity to dispose of documents. Shred-it will be at the event to provide the disposal service. No medical waste, commercial waste, or radioactive items will be accepted. Spring Clean Up Day is held at Republic Services and the adjacent parking lot of the Paducah Public Works facility on North 10th Street. To maintain the traffic flow, drivers need to enter from North 10th Street off Park Avenue. Traffic will turn right onto Burnett Street to go through the drop-off line. Traffic will not be allowed to enter from North 8th or 9th Streets. Household hazardous waste items, e-scrap and batteries, ammunition, and prescriptions are off-loaded last in line. Please separate your items to make the trip go quicker. Spring Clean Up Day is funded in part through a Household Hazardous Waste Grant through the Kentucky Division of Waste Management. Partners include City of Paducah, Clean Earth, Inc., Liberty Tire, McCracken County, McCracken County Sheriff’s Department, Paducah Power System, Republic Services, and Shred-it. For more information, visit www.paducahky.gov or call the City of Paducah Engineering-Public Works Department at 270-444-8511. For the disposal of various hazardous waste substances, the Kentucky Division of Waste Management has prepared fact sheets to guide you through the proper disposal. For more information, visit Hazardous Waste Disposal. To dispose of a live Christmas tree, the City of Paducah urges residents to recycle by taking the tree to the Compost Facility located at 1560 North 8th Street during regular business hours. The facility is open Monday through Saturday, 7 a.m.-3 p.m. Please remove all lights, garland, and ornaments before taking the tree to the Compost Facility. Residents also can dispose of trees by placing them next to their garbage. To report illegal dump sites in McCracken County, contact either the McCracken County Building/Inspection Department at 270-444-4724 or the McCracken County Road Department at 270-442-9163. Your report will be confidential.